Today, I’ll be providing a Georganics mouthwash tablets review to help you decide if this zero waste oral care product is the right choice for you. A few years ago, I started exploring a zero-waste lifestyle, which led me to address my plastic tube of toothpaste in my bathroom. Doing my best to live a low-waste lifestyle meant looking for an alternative to prevent these plastic toothpaste tubes and bottles of mouthwash every month. So I researched my options, and that’s how I stumbled onto Georganics. What Are Georganics Mouthwash Tablets? Georganics is a company based in the UK that provides a full range of natural oral care products. From toothpaste to mouthwash; from floss to toothbrushes; everything that you need to take care of your oral health is addressed by this company in a natural, eco-friendly, and animal-friendly way. The company avoids synthetic ingredients and preservatives, instead opting for natural ingredients in all of their products. For example, you may have always noticed xylitol in your toothpaste (and your chewing gum) because it acts as a sweetener to make things more palatable. However, this is a synthetic sweetener substitute used because it provides sweetness without the oral decay associated with sugar. Georganics skips the sugar and synthetic chemicals by using essential oils. As a result, they can create amazing flavors that I would’ve never imaged I would enjoy before. This red mandarin flavor is my favorite! All their ingredients contain no animal or animal byproducts [vegan], and the company does not test their products on animals. Nor will they do so in the future. All of their packaging material is recyclable and/or biodegradable. Let’s take the example of a jar of toothpaste. The cardboard packaging that holds the product is both recyclable and compostable. The bamboo spatula used to scoop out the toothpaste is fully biodegradable. The glass jar and the aluminum lid that holds the toothpaste is fully recyclable. While both glass and aluminum are widely recyclable, the jars are so cute that I’ve been able to upcycle them throughout my house. Submerge the jar in warm soapy water and the label peels right off with no residue. You now have a cute glass jar [for free!] that you can use to make DIY beauty products, grow a cute plant, and other creative ideas. The Georganics mouthwash tablets are easy-to-use tablets that you combine with water to instantly make mouthwash. Made of entirely food-grade, natural ingredients, this mouthwash gently freshens your breath, so you’re ready to go. No alcohol and no burning sensation that you feel with commercial mouthwash solutions. It feels so gentle to use, yet is effective at combatting breath odors. I love using mouthwash to provide a quick breath-freshener. If it’s the middle of the day and I’m about to meet up with some friends, I’ll take a swig of mouthwash to gargle and spit. Then I feel fresh and ready to go! In my mind, there were 2 main problems with mainstream mouthwash solution (i.e., the ones you can buy at your local convenience store). It comes packaged in a hard plastic bottle that’s, honestly, mostly just water. The alcohol in it burns my mouth! I love these Georganics mouthwash tablets because they solve both my problems and a third one I never even knew I had! Because the Georganics mouthwash comes in tablet form, you’re not paying for and transporting all of that water, since mouthwash is mainly water. You already have access to water via your tap – there is absolutely no reason you need to buy more water. A normal-sized 500mL bottle of Listerine mouthwash will last 1 month if I use it once per day. This means I need to purchase 12 plastic bottles every year that will be down-cycled (i.e., recycling plastic results in a lower quality every time). At around $4 per bottle, you’ll spend nearly $50 a year on mouthwash. Consider the alternative: switching to Georganics mouthwash tablets. This large bottle of mouthwash tablets will last nearly 2 years, which equates to approximately $10 per year on mouthwash. This is a $40/year savings per person (80% savings) on mouthwash every single year. It adds up, especially if you have multiple people in your household. Additionally, the tablets are in a glass bottle with an aluminum lid, both materials that are readily recyclable and don’t downcycle. I either make my mouthwash in my geeky shot glass or in my Turkish teacup, but any small cup will do. Georganics mouthwash tablets are alcohol-free! It primarily relies on baking soda (sodium bicarbonate), which has been studied to be an effective natural alternative to alcohol-based mouthwashes. It also uses essential oils to provide a kick of fresh breath. Note that it doesn’t claim to “kill 99.9% of germs”, which I think is good because if it can kill 99.9% of the bad bacteria in your mouth, it’s also killing 99.9% of the good bacteria. One unexpected benefit of these mouthwash tablets is that I can bring them along anywhere! There have been countless times at the office when I would’ve loved to have mouthwash, but I’m not going to store a bottle at my desk. These little tablets are perfect because I can store a few in a little container and make some whenever I need. I know it sounds a bit ghetto reading this, but you can literally do this at your desk, and it’s totally discreet – just try it once! Plus, they’re easy to travel with. As we all know too well, you can’t travel with liquids. Instead of buying travel-sized bottles for mouthwash, just bring these and make your own wherever you go. Who is this for? Those looking for more natural oral care, people living zero-waste, someone just looking for a really good mouthwash. How long do the tablets take to dissolve? One minute. How many tablets do you use each time? You’re supposed to use one for 20mL, but I like it a bit stronger, so I use 2 at a time. In what do you prepare the mouthwash? I find my favorite geek shot glass to be a perfect size! Weleda: This mouthwash solution is perhaps the most eco-friendly alternative to Georganics. While only 50mL, it’s a highly concentrated solution made with essential oils such as peppermint & eucalyptus (for smell), myrrh (oral disinfectant), ratanhia (astringent and antibacterial), and horse chestnut bark extract (antiseptic). Add a few drops to a glass of warm water to prepare your mouthwash. A drawback (in my opinion) is that it is alcohol-based. I have no experience with how long this bottle will last. Ballot Flurin: A mouthwash spray made from white propolis (a byproduct of bees). Each 50mL bottle contains 125 sprays. If used once per day, this will last nearly 4 months. Jason: This whitening mouthwash with peppermint and calcium ascorbate will freshen breath and whiten teeth. It’s 2:1 concentrated so you can dilute it to 1 part water and 1 part solution if you want less intensity. Undiluted, a 473mL bottle will last about one month; diluted, it will last two months. For readers based out of Amsterdam, make sure you check out my popular post on living zero waste in Amsterdam! CloSYS: A concentrated mouthwash with 100 uses in a nearly 1L bottle. Unflavored and alcohol-free, you can also choose your own flavor by adding a drop of your favorite essential oil. This one bottle will last you more than 3 months and is my top recommendation for US readers. Uncle Harry’s: This is a salty natural mouthwash that can be used diluted or undiluted. I’m a big fan of their clay toothpaste as well. Fly Mouthwash: A concentrated mouthwash that holds 60 uses in a single 48mL container. Simply mix a mouthful of water with a squirt of this, and you have mouthwash ready to use. One bottle will last 2 months. As you may have gathered from my post, I’m a big fan of the Georganics brand, and I highly recommend the product. The Good: It’s a mild mouthwash that gently cleanses your mouth and freshens your breath. It’s simple to use (just add water), easy to transport (no issues with airlines! ), animal-friendly (vegan), in sustainable packaging (100% recyclable or compostable), and made with natural, non-toxic ingredients (food-grade). The Bad: It does not kill 99.99% of good and bad bacteria so I can not longer swish mouthwash instead of brushing my teeth and justify it on lazy days. Save 80% on your mouthwash, protect the planet (by not shipping around water), and switch to more natural ingredients. There are always some hard choice that you need to make in life, but this is not one of them. Switching to Georganics mouthwash tablets is a super obvious choice, in my opinion. This is not a sponsored post, but since I enjoy the products a lot and tell all my friends about it, I have signed up to be an affiliate. 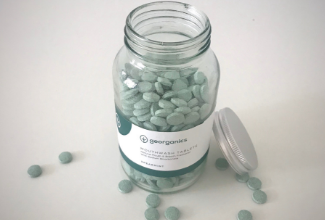 If my review of the Georganics mouthwash tablets was helpful to you, I’d appreciate if you use my affiliate link to try out the Georganics brand for yourself. Using my link will earn me a small commission on your qualifying purchases at no additional cost to you. What? I didn’t know there was such a thing as mouthwash tablets. That’s so cool.